This page will ask you basic information about your wiki. the default lang (also called the master lang). This is the lang to use to create new pages. You will later have the choice to add/delete more langs. Those other langs will be considered translations of the pages written in the master lang. Therefore you will only be able to create translations of existing pages with those langs. This is also the lang that will be used for anonymous users and the lang that will be used as a failtrough when a page in a particular lang will not be found. wiki name is the name of your Wiki. It will appear in your browser's title for example. path of wiclear from server's root : this is the path where you installed Wiclear. For example, if you know your website http://yourwebsite.org serves pages from path /var/www/html and you have installed wiclear into /var/www/html/wiclear, then the path from your server's root is simply /wiclear. In case of doubt, simply leave the pre-filled value, it should be ok.
Reply-to email address : enter here an email address. Each emails that will be sent by Wiclear to your registered users will use this address as reply-to address. 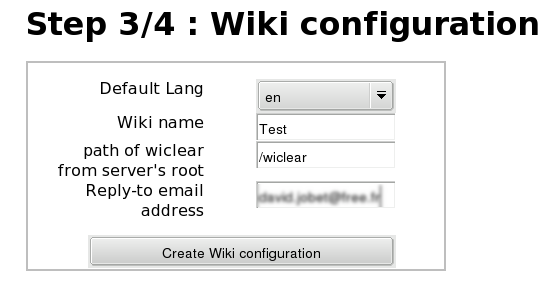 Once you're ready, hit the "Create Wiki configuration". Which means Wiclear has generated its configuration file (conf/config.ini) with the values you just entered. Simply acknowledge by hitting the "Create user >>" button to create the admin user (click to continue).